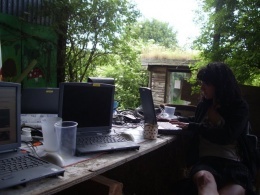 BarnCamp is a low-cost rural DIY skillsharing event open to everyone, including UK activists, campaigners, people involved in social and community groups, and anybody else with an interest in technology and how to subvert it to put it to good use. All skill levels are invited and we promise that workshops are not too geeky due to our infamous nerd gag (though sometimes things slip under the radar). BarnCamp 2015 last took place on the 19th, 20th and 21st June. The next event will be in June 2017 For more info, visit the web site. For news & updates about BarnCamp 2015 and other HacktionLab events, sign-up to our low-traffic announcements mailing list*. £40 (on the gate), £35 (in advance if you pay book and pay before 15th June 2015), concessions available upon request and via pre-booking - go here to register and find out how to pay. breakfast, lunch and dinner from Thursday evening to Sunday afternoon included (9 meals). Food is primarily vegan with some dairy as optional extras. Highbury Farm is a vegetarian farm and the owners request that meat is not brought or cooked on site. There are two pubs in the village for those who really can't cope. Register to come and find out how to pay at the BarnCamp on-line booking web site. 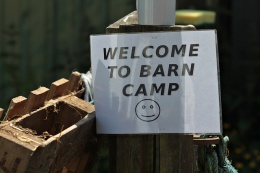 If you're coming, then check out the BarnCamp 2015 Contact page for useful contact information. 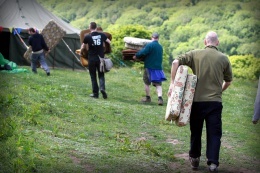 buses from Chepstow and Monmouth, parking in Redbrook village, and on-site for live-in vehicles, hiking. Lots more information on our page about Highbury Farm. Top Notch. Go here for more info on workshops and please add your notes here. 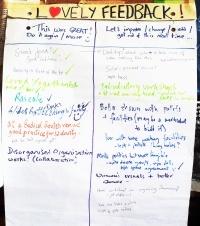 More in-depth details and notes about the current proposed workshops can be found at BarnCamp 2015 ideas scratchpad page. 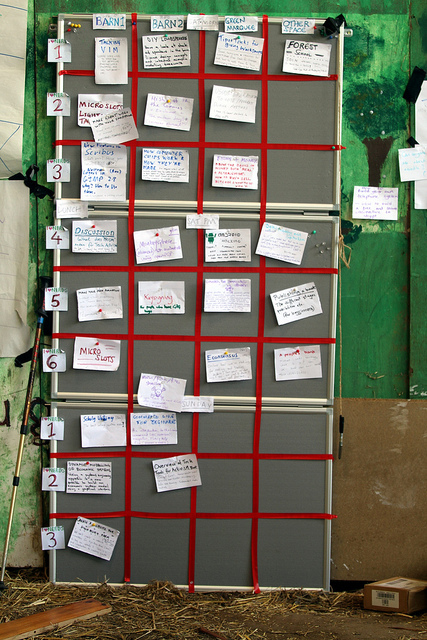 Workshop planning for BarnCamp 2015 is organic and done on-site based on the current workshops proposed at this page . If you've got an idea for a workshop for BarnCamp 2015 drop us an email at barncamp2015 [at] hacktionlab [dot] org. Forward crew arrive on site and begin to set site up. Get involved in the set-up by turning up early. This page details the task ahead. Arrive in the afternoon/evening (see getting to Highbury Farm) for evening meal and campfire gathering and plenary. The bar will also be open. 22.00 evening film screenings and more time around the camp fire. 17.00 onwards taking down equipment and tents and finishing cider. A selection of ShamanicLaptopMassagePics from nor's Laptop Massage session. BarnCamp 2013 organising : task list, includes equipment. BarnCamp 2013 roles : review of roles ideally needed to run a BarnCamp. BarnCamp 2013 ideas scratchpad : workshop proposals and other ideas used to get 2013's BarnCamp together. 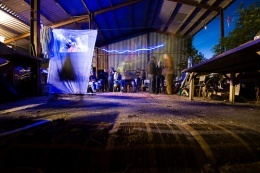 BarnCamp 2011 - the fourth edition of our summer outing took place between 9 - 12 June 2011 in the Wye Valley. We built upon the success of the previous year, keeping the tech turned down, but also consolidating some of the new projects that hacktionlabbers are involved in, such as Be The Media and Network23.org. This year incorporated more off-grid technology with a repeat of the Wild Food Walk, a workshop of knot making and tools for open collaboration. Here's some photos from the event. BarnCamp 2010 - the third edition of our summer outing took place between 11 - 13 June 2010 in the Wye Valley. Retitled BarnCamp we focused on a turning down the tech to make it an event accessible to all with workshops including how to forage for food, how to make a slingshot and the ubiquitous how to encrypt your life. Photos, video and audio from BarnCamp 2010. BarnCamp 2009 took place between 11 - 14 June 2009 in the Wye Valley on the Wales - England border. BarnCamp 2008 took place between 13 - 15 June 2008, click here to view a slide-show of photos from the weekend. There are more photos posted here (now missing) and this exciting short video too (also now missing). This page was last modified on 20 March 2016, at 22:44. This page has been accessed 42,825 times.